It’s been fun to see the modern Mid-Century paint colors we chose for our Alabama client (and friend) come alive on the walls of her family’s new home. We’ve been receiving updates via text message and email. The transformation looks amazing and is just what we’d hoped. Before | After blog update coming soon! While the freshly painted walls are drying and the family is moving in, we’ve been working on design boards for the kids’ room. Being the wonderful mother she is, Holly wanted to tackle her kids’ room first in order to help them adjust to the move and have a special space all their own. Her two young children, boy and girl ages 4 and 2, will share a bedroom and have a fun playroom where their imaginations can run wild. 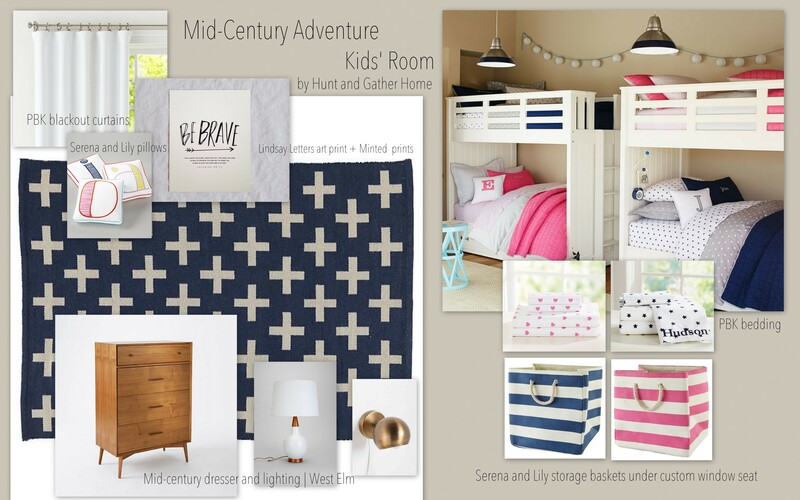 We decided to tackle the bedroom design first and created a few design boards for inspiration. Holly and her husband had already made two important design decisions for the room: the construction of built-in, double bunk beds for the kids and the choice of navy and hot pink comforters. With these two elements in place, we began the fun job of filling in the details. Since the room has wood floors, Holly requested a rug. We knew this would be the main design element that would tie the room together and set the mood for the space. We wanted a rug with a gender-neutral pattern and fun colors. We found several great options, which you’ll see on the design boards below. After the rug, we knew the room needed one other stylish yet serviceable piece of furniture: a dresser or chest-of-drawers. Given the size of the wall and the vertical nature of the bunk-beds, we chose a chest-of-drawers. In keeping with the furniture in the rest of the home, we recommended a fun, Mid-Century inspired piece from West Elm, or a similar vintage find. Though only one piece of furniture in this room will actually be Mid-Century in style, when combined with our rug options, it will help create a fun, vintage-modern look in the room. Small Mid-Century accessories like a lamp and reading lights will add to room’s modern mid-century vibe. In this room, a little will go a long way. 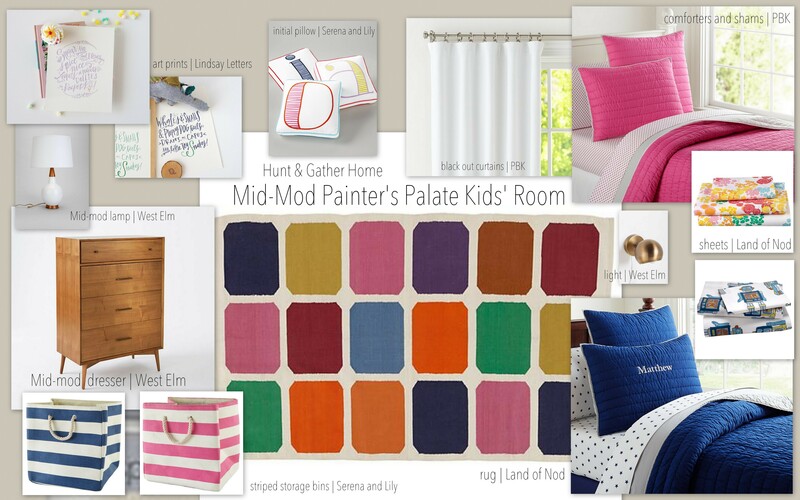 Each design board goes a little further to recommend art prints, storage options, drapery, just-for-fun whimsical linens, personalized throw pillows and additional design ideas for further defining the space. We love putting together design boards as a tool for helping homeowners define their vision for a project and tweak their space. We definitely have a favorite board for this project, but the homeowner is still trying to decide! What do you think? We’d love to know which design board is your favorite. Wow! Girls, you did an awesome job with the kids design boards! 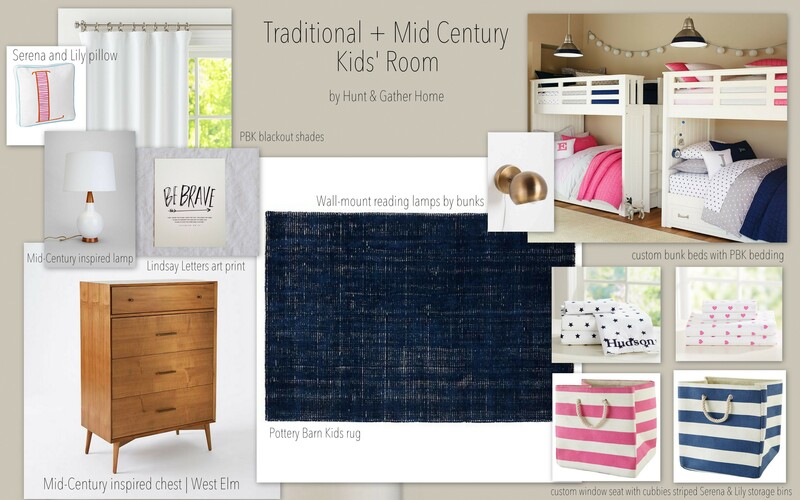 My favorite is with the tribal design rug! It ties the color scheme together so well! I also love the custom bunk beds on the traditional and adventure boards. It’s fun reading and seeing your ideas. Thanks, Fern! That’s my favorite rug, too! Love the added red and orange to bring in a bit more color to the room. I agree with Fern! The tribal rug is perfect. Good job on disergn boards. 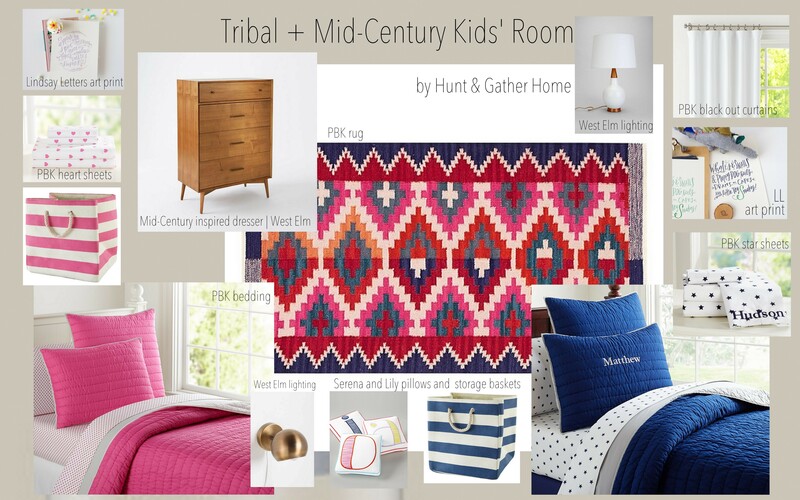 My pick is the Tribal Mid century modern board. I love that rug! I love the board with the Tribal rug. Great colors.